...Also known as "Emmerdale at War" and "If Forrest Gump was a Horse!" Let's face it: Steven Spielberg is THE film director - he's made directing cool! 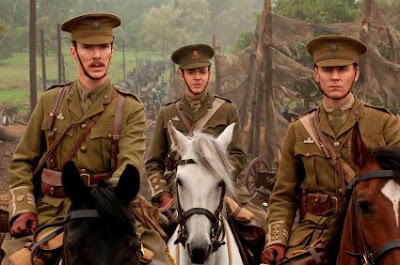 Spielberg's done it all, and he knows how to do it: Spielberg can do adventure, Spielberg can do heart, Spielberg can do war; and Spielberg can definitely do War Horse! The film follows the story of a young farm boy named Albert Narracott (Jeremy Irvine), who raises and trains his remarkable horse: Joey. 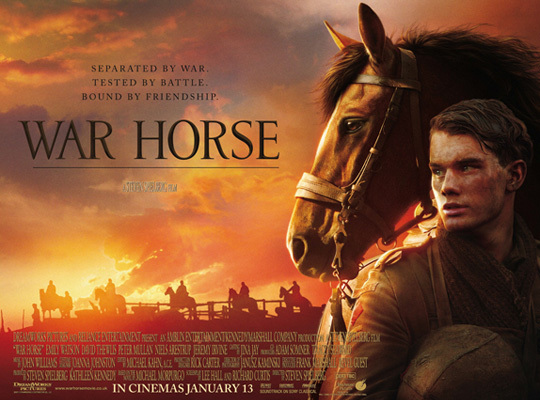 When the news of WW1 hits Britain, Albert's father (Peter Mullan) enlists Joey into the war effort, leaving distraught Albert without his best friend; an event that later results in Albert himself enlisting into the army in order to try and find his beloved horse companion. The film then travels through a number of remarkable war time stories as we follow Joey and Albert through the perils of the First World War. As the title would indicate, the film mainly follows the tale of the remarkable horse Joey as he travels across Europe at the hands of many different types of people in many different situations; each group or individual with their own unique stories, backgrounds and outcomes. This clever narrative tool provides us with one solid singular plot, which in itself consists of a number of smaller sub-plots and tales which cover the many different areas of war. This successfully paints a picture of war torn Europe from the perspective of many countries and people, making the film a rich cinematic tale. John Williams, Spielberg's long time music collaborator, once again composes the soundtrack for War Horse, with a powerful and moving theme that beautifully accompanies each scene and ties the entire film together into one seamless piece. Having already seen success in its novel roots and on stage in the London West End production, Spielberg skilfully adapts this timeless tale to the big screen with cinematic beauty. War Horse beats with a massive heart that left me with a lump at the back of my throat, and many other audience members in tears. Whilst I still feel that this Award-bait release will be overlooked largely because of The Artist (the award for Best Animal Actor still belongs to Uggie the Dog...), this truly is another timeless Spielberg classic that won't soon be forgotten. War Horse is showing in cinemas across the UK now.